There is a timeless honesty and simplicity to the tale of Goodnight Mister Tom that belies it’s relative youth, it’s original Michelle Magorian novel having been published just over 30 years ago and the seminal television adaptation starring the late John Thaw arriving on our screens at the back end of the 1990’s. Both incarnations of the tale have become something of instant classics, beloved and applauded and as such this latest stage adaptation may be seen as having tough, definitive acts to follow, but it also allows it to somewhat ride on a crest of nostalgia and familiarity. For those unfamiliar, the play follows the story of young London evacuee William Beech as he is taken into the relative calm of Little Weirwold, Dorset in pre-WWII Britain and placed under the care of widowed pensioner Tom Oakley. Reluctant without being resentful, Oakley takes the child under his wing and envelops him in the local community, a community which will gradually come to fall under the shadow and grief of war. 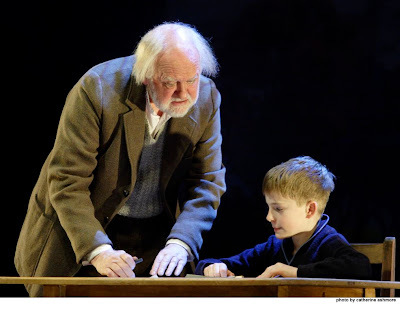 Typical but charming, Goodnight Mister Tom does a wonderful job of encapsulating its niche of period Britain and a genuine sense of charming, bucolic British locality. A core cast of actors young and old alike, many playing numerous parts, as well as some charming and resourceful use of sound, staging and puppetry help create a palpable sense of place and camaraderie which is so key to the heart of the story and show. The real emotional core of the show, naturally, is the relationship between William and the titular ‘Mr Tom’. 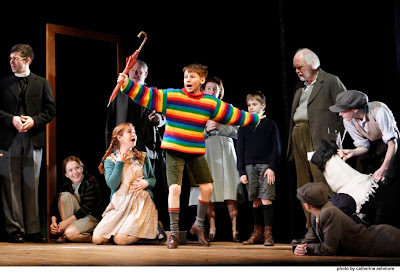 In the performance viewed for this review, young Arthur Gledhill-Franks put in a wonderful turn as William, endearing and focused, hitting the nuances, curves and general arc of the character, including some surprisingly heavy material given the overall familial tone of the show, without resorting to any of the typical child actor pitfalls of whining, over-acting or sacrificing character for projection. Oliver Ford Davies is a master actor and perfect here as the linchpin of the whole show, deftly avoiding the expected cantankerous-old-man-with-a-heart for an immediately more considered and layered turn. His Tom is occasionally quick to temper or reserved in emotion, but never felt typical, overly archetypal stilted, but rather a wholly believable and beautifully realised character of subtle dimension and depth. The relationship between the two is well charted and handsomely acted and does the source material proud indeed. The same can be said of the production as a whole in it being a fairly faithful and mostly successful adaptation of an already much-loved tale. Much of the narrative developments by now are predictable and relatively pedestrian, and although deviations to London and the advent of war do bring in some welcome heightened drama when the pace in Little Weirwold threatens to become a bit too plodding, it is a mostly pleasantly sedate and undeniably charming affair. It does mean, however, that despite a denouement featuring a shocking development that I shan’t spoil, the show as a whole concludes on a pleasant plateau, a warm ‘ahh’ as opposed to a more emotional or engaging peak. Other noteworthy elements of praise include cast members Bradley Hall and Joanna Howarth in particular putting in charismatic and versatile supporting turns as a variety of characters in both locales - Hall giving a goofy, yokel slant to the role of George and Howarth really elevating a scene in a London bomb shelter with shades of comedy and wartime spirit. One of the more unexpected yet surprisingly welcome elements of the show concerned the animal puppetry throughout, most evident in the superb performance given by Elisa De Grey as Tom’s faithful Border Collie Sammy. No doubt inspired by the recent success of similar puppetry in shows such as War Horse, De Grey displays some terrific skills as a puppeteer, bringing Sammy to life with terrific attention to his articulation and mannerisms and personally uttering an expressive and characterful array of barks, whines and other canine soundbites. 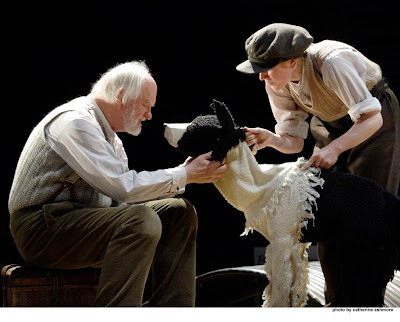 Goodnight Mister Tom is a wonderfully pleasant and tenderly acted tale of friendship, community, family and belonging. It’s familiar in tone, narrative and period, and may be overly so for some audiences, but is to it’s merit in places a little darker and not quite as mawkish as one may first presume. Some of it’s real successes lie in its hearty central performances, in particular Ford Davies reminding us once again why he is one of Britain’s most respected and reliable thesps, some winning puppetry and generally convincing evocation of time and place. Fans of the original novel and television adaptation should be satisfied with the loving, faithful adaptation work and newcomers will find a simple, heartfelt and wholly inoffensive, charming piece of family theatre that should be capable of delighting and entertaining all ages. GOODNIGHT MISTER TOM is running at the New Alexandra Theatre, Birmingham from Tuesday 9 April to Saturday 13th April 2013. Press tickets for this performance of Goodnight Mister Tom were provided courtesy of The New Alexandra Theatre, Birmingham directly. (A)musings Media gratefully acknowledges their generous invitation.